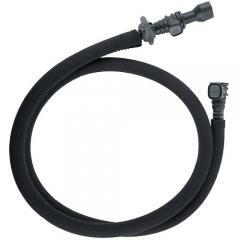 Keep your CamelBak hydration system running smoothly with the help of the HydroLink Replacement Tube from CamelBak. The innovative CamelBak system changed the way that athletes and active individuals stay hydrated in the field. Its compact reservoir system combined with a convenient delivery hose, allow users to enjoy hands-free hydration anywhere. Sometimes however, tubes can break leaving operators stranded and waterless. The replacement tube offers a cost-effective solution to this problem. It simply snaps into the HydroLink exit port and is good to go. There is no need to replace an entire system when only a single piece has worn out or gotten dirty.